As a teacher, one of my favorite things about today’s world is how easy it is to collaborate and share. Whether I’m teaching a new class, a new book, or just want to shake up my lessons, I turn to the power of the internet and my PLN. My Google search history is probably half full of lesson ideas and resources. I research, search, find, and adapt, using the resources that inspire me most to create something new and appropriate for my classes and students. And in turn, I share here, on Twitter, on Voxer, and in every way possible to help inspire others in their work, too. I do this because I believe in the power of sharing. I believe that all of us are smarter than one of us. And I recognize that if I’m isolated in my classroom and teaching the same lesson over and over--rather than teaching my students--I’m not as effective as I could be. I believe in the power of my work and yours. More and more, though, I’m noticing a price tag attached to that work. As I’ve explored new professional networks and groups, I’ve seen sites like Teachers Pay Teachers gain popularity at the expense of free and open source resources. Let me be clear: teachers deserve to get paid for their work. We work hard--harder than most people realize--and we certainly deserve the credit, financial or otherwise. This is not a rant against Teachers Pay Teachers. I’m all for the teacherpreneurs out there who help make a difference in their audience’s teaching and for our students. If you have something great to share, can build an audience, and can be compensated for your work, the more power to you. And I’m sure there’s so much great content out there that’s worth paying for for many educators. But every time I see an educator promote a paid resource like a lesson plan or worksheet, my first reaction is concern. And my second, often, is frustration. I’m concerned and frustrated because too often, these paid resources promote mindless duplication of a stock resource that’s not easily adaptable in meaningful ways. Full disclosure: while I’ve never posted any of my resources for money, I’ve sure thought about it. Like you, I believe that I have some great materials worth sharing, and maybe even worth paying for. But I decided not to for the very reasons I explore here--I want to promote innovation, collaboration, and open source sharing throughout education. But too often, the resources I see shared are online worksheets that promote little-to-no higher level thinking. Too often, they are devoid of collaboration and creativity, too. Too often, it looks like a page from a textbook was digitized, described with buzzwords, and posted for profit. Before pulling the trigger on that purchase, ask yourself how that worksheet or resource is going to help prepare students for the worlds of today and tomorrow. How is a worksheet going to prepare them for the world today? Why is it this the best way to teach these skills and contents? Then, make sure to follow up with questions that promote adaptation and creation rather than duplication. Remember, what works for someone else might not work for you the same way. Ask yourself: How can I adapt these materials to make them more effective for my students? Or even better, how can I use this as a starting point for active learning experiences? And if you’re posting and sharing your resources, please continue to do so. But do it well. If we’re going to privatize and monetize educational resources, we need to help educators do things better. We need to be better. 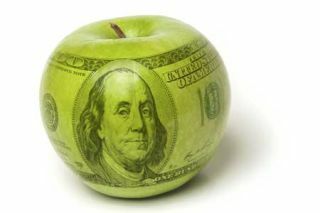 What’s your stance on teachers paying teachers? Please share your thoughts in the comments or on Twitter @MrSchoenbart.